How to interpret interaction/main effect of a zero inflated regression model? Is a post hoc analysis necessary? I am not sure if this is the right place for this question as it is more about the interpretation of a model. Let me know if this is not the right place! 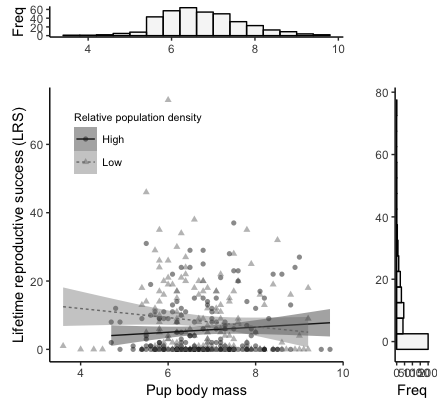 I get a significant interaction term, which tells me that the effect of pup body mass is dependent on whether population density is high or low. I have learned that I should not interpret the significant main effects. But with just the interaction term I can't conclude whether the effect of pup body mass is actually significant at either density. I just know that the slopes are different but I can't tell whether they are different from zero, right? Could I just subset the date into low and high density and rerun the analysis? But then I don't correct for multiple testing, but do I actually have to? Or is there another way to do this? Or should I interpret the main effects from a model that does not include any interactions? Browse other questions tagged glm interaction or ask your own question. How to calculate interaction term as odds ratio in logistic regression? how to interpret the p-values on models with significant interaction terms on glmer? Significant interaction in linear mixed effect model but plot shows overlapping confidence intervals?